Term Limits are Good for Association Volunteers. Why not for Staff? You are here: Home / associations / Term Limits are Good for Association Volunteers. Why not for Staff? So, my diatribe about Medium and how bloggers shouldn’t fall into the trap of believing that individual blogs are worthless and we should, instead of writing on sites we control, write–for free– for sites that make other people millions apparently piqued my curiosity about what writing on Medium was actually like. So I wrote a post about being an eternal job hopper and, after nobody reading it for the first day, it suddenly got noticed and recommended by a friend…then another, and another, and suddenly I was almost believing the hype about the magic of Medium. It was just like the old days of blogging–people sharing, people commenting, people liking. Then it was back to regular old blog life, except instead of having that article live here on good ol’ Mizz Information, it’s now on Medium. I suppose I could also post it here, but I admit that part of the reason I posted it there–in sort-of anonymity–was because I wondered about the advisability of writing about being a perpetual job hopper here on my own turf. Being a job hopper in the startup world is no big deal, but in the association world, loyalty and tenure are attributes that are celebrated and job hopping…not so much. So…why is what’s good for the goose (board members) not good for the gander (association staff)? Why is it apparently a near universal truth that volunteer leaders can only maintain the right level of passion, focus and creativity for a finite period of time, yet paid staff are not subject to the same limitations? If a board member were to serve one year terms at association after association, the world would think that person a go-getter and someone who steps up and brings fresh thinking to each new volunteer role. But an association staffer with that same track record? I can speak from experience and assure you in no uncertain terms that someone who has a number of short-term stints at various association jobs is NOT met with the same admiration. 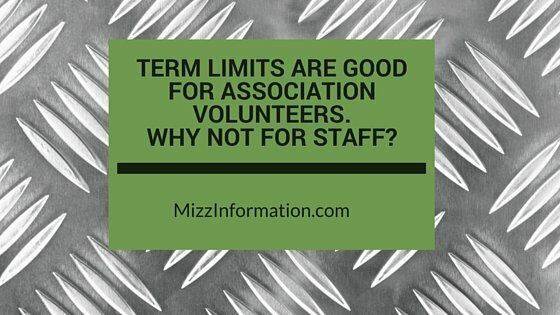 What if associations were to apply the same rationale about term limits to staff as they did volunteer leaders? Namely, maybe not necessarily a good thing in the case of dedicated, hard-working volunteer leaders who are able to remain dedicated to moving the organization forward and who understand that constant change is not a bad thing, but that the association is better off without the stagnant, complacent, no longer effective ones. What if associations, instead of places people consider safe havens for people who are willing to trade lower stress and lower paychecks (in some cases) than jobs in the for-profit sector for stability and the knowledge that, in many cases, as long as you at least phone it in–or sometimes even that isn’t necessary–you’re pretty much guaranteed a job for as long as you want it, economy-willing, started applying term limits to staff? Made staff be accountable on an annual or bi-annual basis for justifying why they are still the best candidate for their slot on the org chart? And why, after 10 or 15 or 20 or more years, their skillsets are worth that much more than what it would cost to bring in someone new, someone who probably has fresher job skills and would be situated much lower on the salary grade scale? 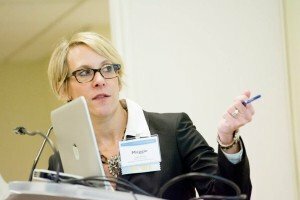 I’m not advocating putting high performing staff who are willing to remain dedicated and competitive on the open job market out to pasture just because; however, rewarding complacency with a pay increase and a job year after year regardless of performance? If that’s no way to make up a high-functioning board, surely it’s no way to maintain a high-functioning staff, right? Yet, how many associations do exactly this, even while rigorously maintaining volunteer term limits? A LOT. I personally think that it would be awesome and would go a long way towards keeping associations as edgy and competitive as their for-profit counterparts–or the competitors that have yet to exist but are surely coming–to apply the same term limit philosophy to staff as they do volunteer leadership roles. In a world where “we’ve always done it this way” is now recognized as a horrible business model, the association world seems awfully wedded to thinking that institutional knowledge and loyalty are worth a whole lot more than cutting-edge business skills. If data-driven is the future of associations, shouldn’t driven employees who are constantly looking to up their game also be part of that mix?